You’ll have to take my word because you weren’t there, but for one day this spring I found my swing. The ideal swing for me, starting with a nice full turn back without my troublesome loop at the top, then down the perfectly proper path to contact and through the ball to a fully executed belly-button-forward finish. I held the pose. Of course I did. I did all that, yes, but can’t take credit. While my hands were on the club’s grip, the club was safely secured in the arms of my teacher, which happened that day to be a robot. Yes, robot. 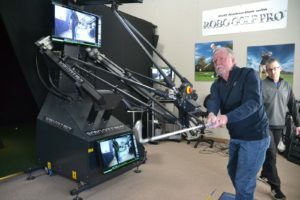 I took a lesson with RoboGolfPro, which just might be the most technologically advanced swing training method in all of golf. Put it this way: If George Jetson took golf lessons, it would be like that. The author gets a little guidance from RoboGolfPro, showing him the perfect swing. 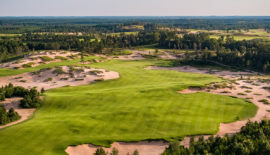 The lesson took place at the recently opened One Under Golf Center in DePere, Wisconsin, near Green Bay, a facility that also includes golf simulator, hitting bay with launch monitor, putting green, club fitting area and more. 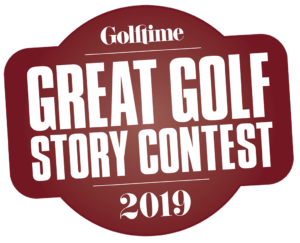 But I was there to meet the robot — or, more properly, for a demonstration of the ultimate in high-tech swing help under the guidance of Matt Wood, director of instruction at One Un­der as well as men’s and women’s golf coach at the University of Wisconsin-Green Bay. 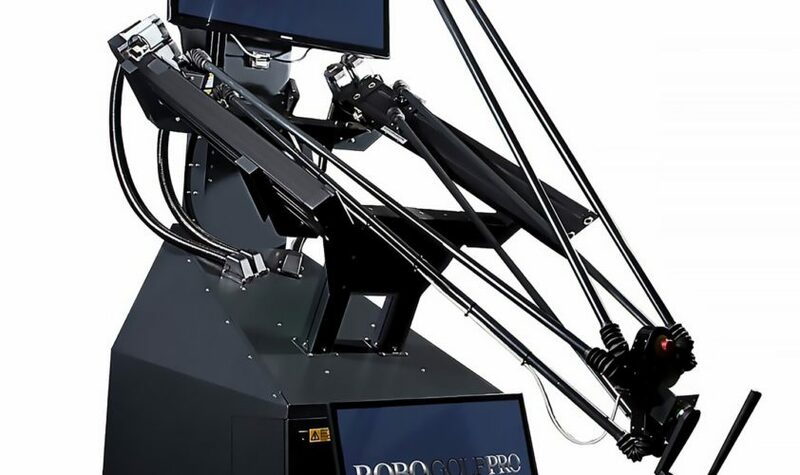 RoboGolfPro was designed to speed up the learning curve for golf instructors and students by allowing the aspiring golfer to actually feel the ideal swing. 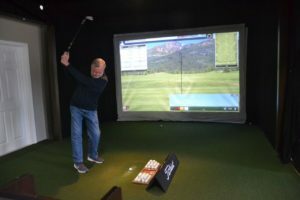 As Wood put it, it’s one thing for a teaching pro to tell a student, sometimes over and over, what he or she should be do­ing; it’s another thing entirely when there is a robot to almost instantly help the student feel that elusive ideal swing. Wood began our session by watching and videotaping my warm-up with a 7-iron in the simulator. As Lincoln found at Gettysburg, there was much to address: that pesky loop at the top of my backswing, a little drift in the turn, too much right hand influence that caused “scooping” at contact and a tendency to fall back instead of finishing high, all of which help explain a handicap in the teens. Then we moved to the robot, where the robot, using the data Wood had given it about my club head speed, direction and other elements of my flawed swing, helped me make the proper swing. A TV monitor in front of me allowed me to watch while the robot and I went through the steps of the swing. And as long as I held on and went through the motions, it was going to be right. “The robot can make (the student) do what we’re asking them to do,” Wood said. RoboGolfPro was designed to speed up the learning curve for golf instructors and students by allowing aspiring golfers to actually feel the ideal swing. student may fail to catch a teacher’s instructions but the robot’s desired swing cannot be misun­derstood. It forces the student to feel from takeaway to finish exactly what the desired swing should feel like and to repeat it until it feels right. If one part of the swing is especial­ly troublesome — the takeaway, for example, or the finish — the instructor can have the robot isolate that part of the swing in addi­tion to the full swing experience. After time with the robot it was back to the simulator for the tricky part — emulat­ing the perfect swing on my own without robotic assistance. 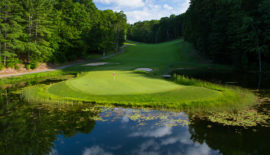 Wood videotaped those shots as well to compare with my earlier, pre-lesson swings and watched to see if I was incorporating his advice — tucking my right elbow more and making a more com­plete turn. With more than one swing thought in my head contact was less than perfect but it was clear I was addressing — or trying to — my swing needs. The high-tech help didn’t end when I walked out the door, either. An hour later Wood emailed a 14-minute video of my ef­forts with three drills aimed at eliminating the issues my lesson had identified. 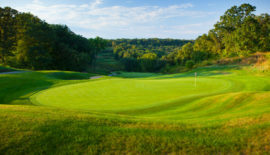 According to RoboGolfPro, even on the PGA Tour there is some interest in robotic teaching. Bryson DeChambeau and Vaughn Taylor are said to be owners and believers. 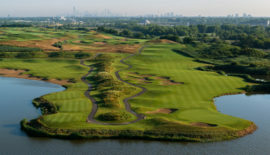 If I can get that day’s swing to the course, I’ll be a believer as well. Which begs just one question: Where will I find a golf cart with room for my robot?